John Passmore studied briefly at Julian Ashton's Sydney Art School before travelling to England in 1933, where he remained for 18 years. Inspired by modern French painting, in particular the work of Cézanne, Passmore returned to Australia in 1951 and began teaching a generation of young artists including John Olsen, Yvonne Audette and William Rose. 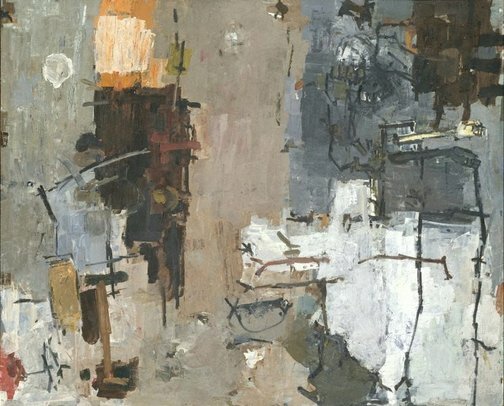 Passmore took part in the avant-garde exhibition 'Direction I' held at Macquarie Galleries in 1956, which launched abstract expressionism on the Sydney art scene. During this period, Passmore derived his images principally from the waterways of Sydney - fishermen, jetties and the changing patterns of sea and sunlight. Signed and dated l.r. corner, "August 1959 [pencil]/ -Sept. 1959 [brown (oil? )]/ J.Passmore [(pencil?)]". Art Gallery of New South Wales picturebook , Sydney, 1972, 123 (colour illus.). Art and Australia [vol. 1, no. 1] , Sydney, May 1963, 11 (illus.). Civilized magic: an interpretive guide to Australian paintings , Toorak, 1974, 21 (colour illus.). Art Gallery of New South Wales Quarterly , 'Acquisitions for 1959', Sydney, Apr 1960, 19 (illus.). Jill Sykes, Look , 'Remembering John Passmore: a home for the works of an important Australian artist', pg. 20-22, Sydney, Aug 2004, 20 (colour illus. ), 21. Editor Unknown (Editor), The Sydney Morning Herald , Sydney, 19 Sep 1959. Editor Unknown (Editor), Daily telegraph and daily news , Sydney, 17 Sep 1959.